This project ended successfully on 1/8/2018 20:55! We'll publish a list of all the people and organizations that have supported our participation at Worlds. We're going to publish a video diary about our adventures in Cincinnati. With a shout out to thank you for your generous support. Choose a photo from ultiphotos.com coverage of Worlds. They'll take pictures at 5 of the Wizards' games, and lots more besides. You tell us which print you want, we'll order it for you. 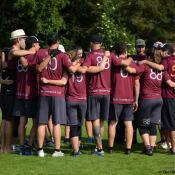 Want an official Worlds disk? We'll bring one home for you. Want us to run a frisbee practice/tournament for your work/children's school/local youth group/...? We'll organize and run a session based on your needs. Up to 40 people, 7-77 years old. Andy Richardson. President, Geneva's Flying Disk Wizards. Playing ultimate since 1994, member of the Wiz since 2003.